Before you begin a cake, it is essential that you purchase cake decorating supplies necessary to making the particular cake design. Beginners usually need to buy several items to start; once more advanced, decorators might only need to supplement their current supplies with one or two items. If you plan to decorate several cakes, it may be worth your time and money to purchase some of the basics found in most decorators' kitchens. Frosting spatulas, couplers, and pastry bags are in most decorators' cabinets. Choose tips based upon the cake decorating instructions for the particular design you want to make. Quality supplies are essential if you plan to do more than make the occasional cake. However, if you are doing an unusual design that calls for a specialty tool that only accomplishes that particular element, you might want to consider buying a cheaper option. For example, purchasing high-quality tips are a good investment, but you can make your own pastry bags using parchment paper to decorate small areas, rather than using store-bought bags. Look for brands with a good reputation in the cake and baking industry. Two well-known supply companies are Wilton and Ateco. Both companies offer supplies at various merchants and retailers. Get recommendations for other quality brands from other bakers in online forums or through experts at your local bakery or supply store. Fancy Flours has a nice selection of both trendy and retro-style decorating supplies in addition to carrying the basics. Pick up popular mustache sugar sets or vintage wedding toppers that range from the 1920s through the 1970s. Hobby Lobby is a great place to look for cake decorating supplies in person. They carry character-shaped pans, ready-made fondants, and numerous colors. Find several well-known brands besides Wilton at Hobby Lobby, like AmeriColor and Sunny Side Up Bakery. Global Sugar Art ships worldwide and offers over 10,000 decorating products to their consumers. Pick up your basics or find something special for your next cake, like gelatin veining sheets and edible sugar diamonds and gemstones. Kitchen Collection carries baking and decorating supplies. They stock multiple Wilton products, including colors, icing tips, and cupcake decorating sets. A limited selection of Duff Goldman products is also available, along with several other brands. 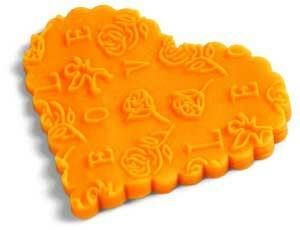 DecoPac offers licensed character products, such as stencils and cake toppers, to help create a specific style of cake. Decorators interested in creating edible images will find PhotoCake supplies, like edible ink and papers, here. 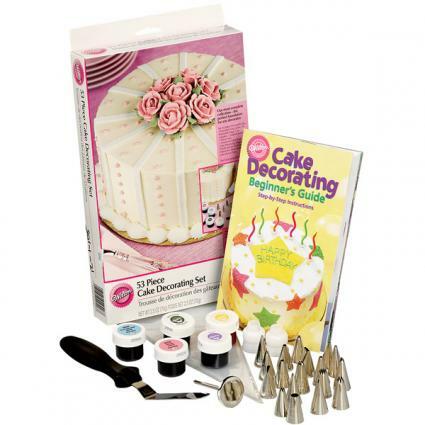 Kitchen Krafts specializes in cake decorating supplies and has everything you need from ready-made fondant to impressions, molds, and cake boxes. Pick up airbrushing supplies here or browse their various supplies for hard-to-find items, like fabric texture sheets. Supplies can add up in cost over time. These retailers can help you find what you're looking for at a more reasonable price. The Baker's Cupboard has a best price promise that guarantees their prices are the lowest around. They also offer discounts if you are shopping in bulk. Fondant Source is a discount cake and craft store that features sales and clearances on everything from stencils to dust to cupcake packaging. Cake Supplies for Less carries Wilton products at a discounted price. All of their products are offered below retail cost. ShopBakersNook not only has numerous decorating supplies at low prices, but they also offer a cash back program for customers who open an account. Look for coupons in the Sunday paper for local craft stores and kitchen supply stores to get a discount on products. If you have a friend who likes to decorate, share expensive, rarely used supplies. Once you begin amassing a collection, keep a list of supplies you all ready own. This will help you avoid duplicating items that have worked their way to the back of your cabinet. Consider getting organizational supplies, too. 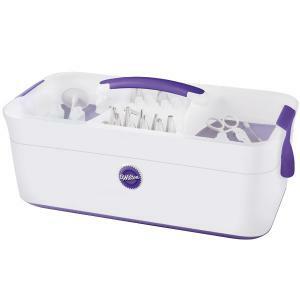 A cake decorating caddy might seem excessive when you first start out, but many bakers find them useful when they have a large amount of supplies to store. Sign up for newsletters online, through supply stores and brands. You will find out about the newest products and techniques without any effort. Additionally, you may receive a discount code or two for use on your next purchase. 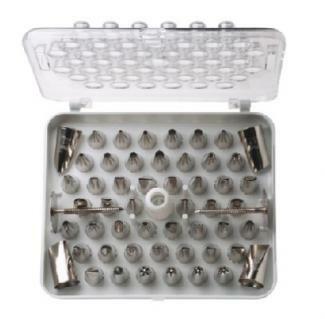 Once you discover a particular product you like, consider looking for cake decorating supplies wholesale. You may be able to buy the product in bulk and save additional money; some companies might even have an auto-ship program to make sure you never run out of a particular ingredient. The purchase of your supplies, whether online or in a store, is one that you want to take seriously, especially if you are just starting out or just starting a decorating business. Save money on rarely used items but make sure you look for discounts on quality items.